A trip to the dentist might not hurt your pocket if you have dental insurance. All you have to do is flash your insurance card, cover your co-pay, and be on your merry way. But without dental insurance, a routine visit might be more than you bargained for. Not only is there the agony of dealing with all that noisy scraping, sucking, and drilling, but you can get hit with a hefty fee for services. 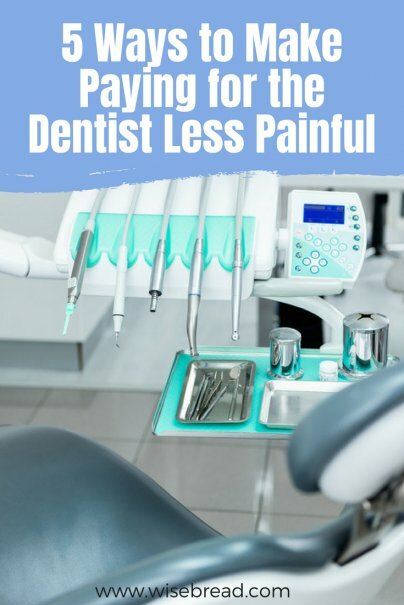 There isn't much you can do to make the actual appointment more enjoyable, but there are ways to ease the financial pain of paying for a dental visit. Take a look at these five tips on how to make paying the best part of your dental appointment. If dental insurance isn't offered through your employer and you can't afford monthly premiums on your own, purchase a discount dental plan. These plans vary depending on the plan provider, but are significantly cheaper than dental insurance. For example, the Careington Care 500 Series discount dental plan costs about $159 a year for a family plan, and offers discounts of 20% to 60% for most dental procedures. Instead of paying a usual fee of $57 for a routine six-month checkup, the discounted fee for plan members is $15 — a savings of 74%. The plan also covers other dental procedures, such as X-rays, fillings, crowns, root canals, tooth replacements, and tooth removals, as well as cosmetic dentistry and orthodontics care for adults and children. If you're interested in these discount dental plans, DentalPlans can help you find the perfect plan for your needs and budget. The site allows users to search, compare, and select from more than 30 discount dental plans that offer savings of 10% to 60% off most dental procedures. Going to the dentist might not be the highlight of your day, but skipping regular examinations could end up costing you more in the long run. Regular six-month examinations are crucial for good oral hygiene. Your dentist can identify dental problems early and treat a small issue before it worsens and becomes an expensive one. If you have a small cavity, your dentist might be able to fill the cavity at a small expense. On the other hand, if you ignore a cavity and the decay worsens, fixing the tooth might require more than a conventional filling, and you might need a dental crown. The more extensive a dental procedure, the more you'll pay out-of-pocket. Make sure you visit the dentist at least twice a year for a professional cleaning. And if you experience toothaches, bleeding gums, or other oral problems, let your dentist know sooner rather than later. If you don't have a dental discount plan or insurance, speak with your dentist's office in advance to see if you can get a discount for paying cash. Some dentists prefer cash payments directly from patients because they don't have to deal with insurance claims. Never underestimate the power of negotiation. If the dentist knows you don't have insurance, he might surprise you and knock money off your bill. "Many dentists will offer around 5% off if you pay cash up front," says Dr. Lawrence Wallace, CEO of Larell Surgical Consultants, a California company that evaluates claims for insurers. Also, it doesn't hurt to ask dentists to charge you the same rate they charge insurance companies, which is usually 10% to 15% off a regular office visit or procedure. This may not work out, but it's worth a shot. Before a dental student can graduate and start working in a dental office, she needs to practice on real people. This is where you come in. Going to a dental school for routine dental procedures, such as cleanings, fillings, and root canals can result is a cheaper dental bill. To give you an idea of the potential savings, the Indiana University School of Dentistry charges "about half what a dentist might charge for preventative care like a cleaning." The thought of a student working on your mouth might sound scary. However, these students only perform services on patients as they near graduation, and always under the supervision of an instructor. You can check the American Dental Association's website for a list of accredited dental schools in your area. Personally, I went to a dental school to have my wisdom teeth removed after college when I didn't have insurance. Everything went according to plan, and they got me sufficiently high on gas before the procedure. All things considered, that was the best part of my day. If you don't have a lot of cash to pay for dental care, consider bartering for discounted or free services. Maybe you have a skill that can benefit the dentist, such as web design, office cleaning, or marketing skills. Contact the office manager and leave a message for the dentist asking to trade services in exchange for dental care. Do you have other ideas on how to save money on dental appointments? Let me know in the comments below.